Using retransfer technology, the Prima 4 produces photo quality cards, comparable to offset litho printing. FIPS 201 certified for the personalization of US Government credentials, the Magicard Prima 4 provides a reliable, robust solution for instant issuance in a compact package. Using a retransfer printing process, images are first printed onto a thin film then heat transferred onto the card surface. This produces a high resolution glossy image, printed right over the edge of the card. 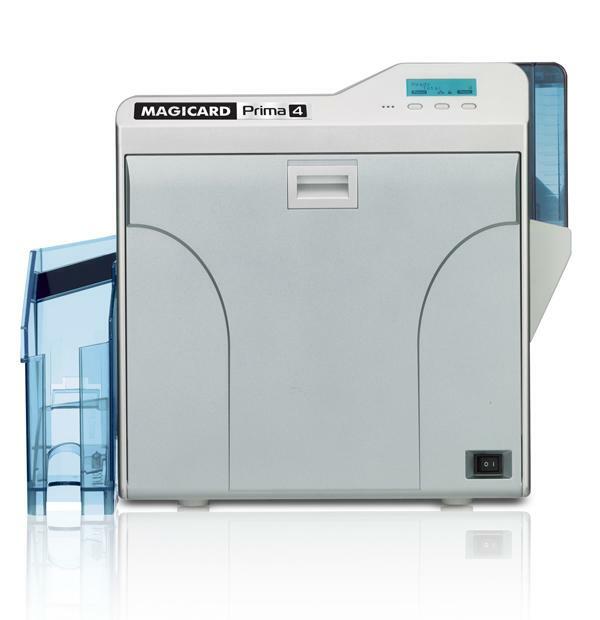 The Magicard Prima 4 can be equipped with a range of card encoding devices to write secure electronic data to cards at the point of issuance. Smart Card encoding options include contact chip, MIFARE, DESFire and iClass. Specialist high-security encoders, such as EMV accredited devices, can also be fitted for the in-line personalisation of payment cards. The Prima 4 can also be supplied with a magnetic stripe encoder built-in. Magicard Prima 4 with UltraCoverPlus – our promise to keep you printing.The reliability of our well-established print engine enables us to offer you a comprehensive 3 year warranty with full telephone and online support. This includes a free replacement for any printhead damaged over the lifetime of the warranty. In the unlikely event of a field failure, we will overnight a replacement loan printer to you whilst we repair your existing device.